As we mentioned in an earlier post, it’s still fig season for another few weeks. This is a delicious way to eat up those unused figs or to try making this with some dried ones if you have had a hard time finding fresh ones. Believe it or not, this dish tastes delicious with either fresh or dried figs – we’ve had it both ways. We have taken a dish/recipe by Daisy Martinez and, because of time and space, adapted it a bit. In Daisy’s recipe, she makes her version of a Sauce Espagnole, or brown sauce, before adding it to the browned chicken. In addition to adding some smoked pimenton (smoked paprika) to my own version of the brown sauce, I also decided against straining the sauce and, instead, used a potato smasher (my hand blender isn’t in my apartment right now) to create a thick, chunkier sauce. The result is a very satisfying, yet light dish. Ok, so there is some bacon and bacon grease used in the recipe, but it’s only to add depth of flavor. Other than that, this meal is relatively healthy and would work well with dried figs for a fall or winter meal. I highly recommend trying this dish. It would make a fabulous and cheap meal to make for a big group dinner, as well. Hey, we are in a recession! Gotta get creative! Make the brown sauce by first browning the bacon, allowing it’s fat to render. When it is browned, remove with slotted spoon and drain most of the rendered bacon fat, leaving only about 3 tablespoons. Add the celery, carrots, onion, garlic and thyme and brown them in the bacon fat on medium heat for about 10 minutes. Sprinkle the flour on the veggies and stir until it is all incorporated. Now add the pimenton and stir to incorporate well. Make a well in the veggies and add your tomato paste. Allow to cook for a few seconds then stir into the veggies. Cook for another minute. Turn down the heat and add your calvados and/or brandy. Allow to burn down until it is evaporated. Once it has evaporated, add your stock, cloves and bay leaves and bring to a boil. After it comes to a boil, adjust heat so that it cooks at a gentel boil. Stir occasionally. As the Sauce Espagnole cooks, brown your chicken on medium-high in a heavy-bottomed pan. Add some oil to the pan before you begin and cook, turning to brown both sides – about 10 to 12 minutes. Once browned, lower heat and remove your browned chicken for a moment. Turn heat up to medium-low and ladle in some of the cooking Sauce Espagnole (it’s not done yet, remember!) and pick up the browned chicken bits from the bottom of your pan. Once it is all incorporated and there are no bits left on the bottom, pour in the rest of the Sauce Espagnole into that pan. Add your chicken pieces back along with the crispy bacon and your figs. Turn heat to medium and allow to cook uncovered at a simmer for about 25 minutes. After 20 minutes, cover and continue cooking for an additional 25 minutes. Right before serving, remove figs and chicken pieces to separate pan. Take out bay leaves and discard. Using a potato smasher or hand blender, lightly crush (or quickly pulse hand blender a few times) the very soft veggies down. If you feel it needs a bit more “body”, sprinkle in a bit more flour. Arrange some chicken and few figs on the plate and spoon some of the sauce on top. Serve with roasted potatoes or a hunk of crusty country bread. 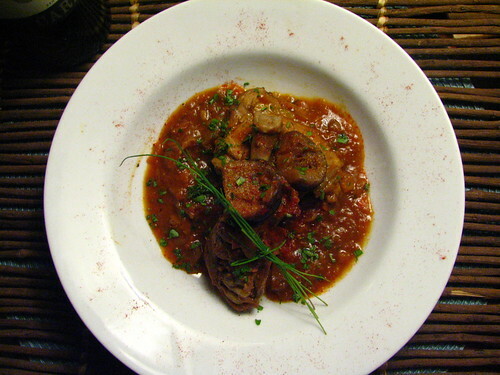 Oh yummy…I love the idea of adding Calvados with this dish for a rich flavor…thank you for this. this is delicious. It sounds so fancy, i love that it is actually not. I can use our dried figs in this recipe — yehey! This dish has winner written all over it. I love that it’s also great as a fall-time dish, hearty and filling. Sauce Espagnole, here we come! This sounds like a nice autumny dish (London’s pretty cold right now!). And for this and all the other amazing recipes I’ve read over the last year, I’m passing the Brilliante Weblog Premio 2008 Award onto you guys! My mouth actually began to water as I looked at this post…and it’s only 7AM! This, indeed, is ‘delicious stuff’! Ah, yes. This looks like a keeper. Will definitely be trying this one. Great photos! This looks delicious. I love cooking with figs, and am looking forward to making a fettucine with roasted figs, smoked salmon and gorgonzola, but figs are just so damn expensive I can’t justify cooking with them. But this looks worth it. It certainly is fig season, we’re eating figs like crazy now. I’ve been wondering what to do with the rest of the figs, now I know what to do with them for dinner! Your addition of calvados has me thinking….how would a cocktail with calvados and fig puree fare? Hmmm….., will let ya know! You keep reminding me that I need to stop in my old neighborhood and pick some figs for free. Then I need to dry a bunch and roast some. This looks really good. Even though it’s 100 degrees, I’d totally hit that. I really like the sound of this savoury way of using figs. We have a fig tree on our patio and I plan on making this delicious looking recipe with the figs! It looks so delish and great photos! I’m definitely bookmarking this! My hand just reached out and picked up some dried figs at the Iranian grocer when I wasn’t looking. I’ve been looking out for a savoury dish, and voila! It’s a sign. Oh how gergoues. I love anything with that smoky flavour and with the sweet figs it sounds wondefully unctuous and satsifying. 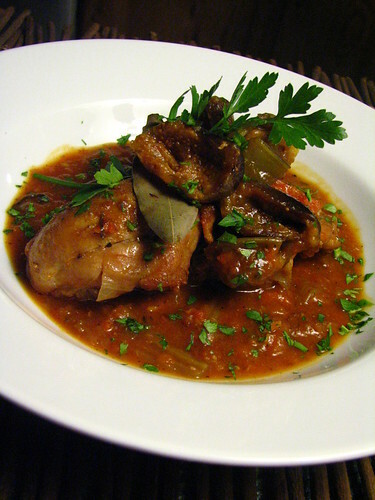 That looks like a great variation on Moroccan-style stews where chicken or lamb is often cooked with raisins or prunes. My neighbor in Brooklyn just planted a fig tree and now I want one. Thank you so much for voting for my DMBLGIT photo! I was so surprised and thrilled! Mmm. Figs. The recipes are cropping up all over. And it reminds me that I’ve got to get out to the market and pick some up! I’m loving this concept! Thanks for sharing. Just remember – you can TOTALLY make this with dried figs! and peter – you’re totally right. it is a bit like a moroccan tagine in essence. Oooh, this looks delicious! I love combining meats with something sweet and figs seem like an excellent choice. I’ve made chicken with a apricot and honey reduction that was delicious, I’ll have to try this one. Wonderful! I really enjoy the combination of fruit and meat, this looks fabulous! Beautiful combo of flavors here Amy! I would be one happy girl with this in front of me! Wow! looks incredible! I just received a new batch of figs from my grandmother’s backyard and guess what I’m making?! This looks wonderful and like a nice segue into the coming fall. I love figs and I buy them quite often these days – while the supplies lasts so to say:) Sounds like a very interesting dish to try. I can sort of “taste” the taste of it, since we use sweet fruits, such a apricots, plums, grapes although dried version of them, in stews. Yum yum! Oh that really does sound excellent. I like dishes I can make for a crowd. I was just reading Food & Wine magazine, and saw a cake with figs and was thinking I must cook with them NOW. I just might try this recipe. Thanks much. this looks really delish! i will definitely try it out when the weather turns colder. yes, i know fresh figs are available now, but somehow the dish just looks so wintery to me! This looks and reads lovely. I have always liked the theme of using what is close at hand on the table, outside in the garden, or out in the orchard, or even in the pasture. Meat, fruit, vegetables, spices, and love, all in the same pot. I am so glad I found you, or is it the other way ’round? This recipe looks wonderful. Will be on my short list for sure! beautiful photos, by the way. I’ll be back for more. I am in the process of cooking your recipe … and I realized, when I got to the point where you incorporate the chicken and Sauce Espanol, that you hadn’t indicated when one is supposed to add the pimenton. I simply added it when I combined the sauce and chicken, but I’d be curious to know when you did. Haven’t tasted it yet, as it’s still cooking. Hi, Hazel! Thank you SO Much for not only making the dish, but for noticing our error. We found that in the earlier days of our blog, unfortunately, sometimes steps were missed! I think when you added the pimenton was absolutely fine (let me know what you thought). I would normally add the pimenton around the time I add the flour to the veggies. This way the pimenton has a longer chance to really permeate the rest of the dish. But that’s the beauty of cooking – sometimes you can take a recipe and do things different ways and come up w/ the same (if not better) dish! I’d be curious how your dish was! Thank you so much for your comment. Hi Jonny & Amy. I have a tendency to play with recipes a bit, and I cook enough that I’m comfortable doing so. In this case, I didn’t use flour, and since I only had half the figs required I added currants. (And, as you know, I added the pimenton later than you would have done.) It was delicious. Thanks for posting the recipe.